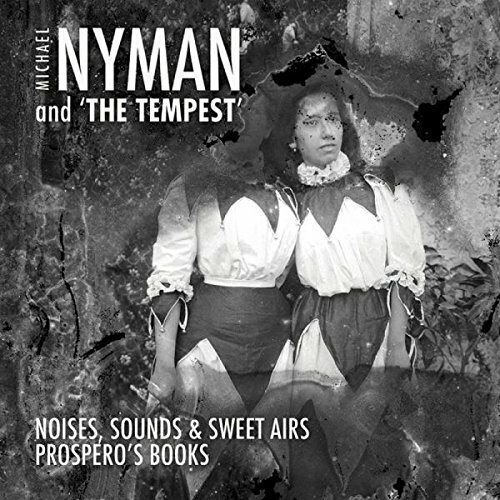 This set represents a re-packaging, on MN Records, of two of Michael Nyman's full length scores from the 1990s, both scores relate to Shakespeare's play The Tempest. Sarah Leonard, Marie Angel, Ute Lemper and Deborah Conway, with Michael Nyman and the Michael Nyman Band, perform Prospero's Books the music to Peter Greenaway's film, whilst Catherine Bott, Hilary Summers and Ian Bostridge, the Ensemble Instrumental de Basse-Normandie, David Roach and Andrew Findon (saxophones) under musical director Dominique Debart perform Noises, Sounds and Sweet Airs a setting of text from Shakespeare's play which dates from 1995. Michael Nyman's most iconic early film score remains The Draughtsman's Contract (Peter Greenaway's 1982 film). That for Prospero's Books (the 1991 film directed by Peter Greenaway starring John Gielgud) seems to have been his last for Greenaway as Nyman says in his CD booklet that he was dissatisfied with the way Greenaway used the soundtrack. In fact the score is a blend of existing music from Nyman's La Traversee de Paris,selected by Greenaway, new music and re-workings of existing. The score is mainly instrumental with songs for Ariel (Sarah Leonard) and then Marie Angel, Ute Lemper and Deborah Conway perform in the masque at the end. By contrast, Noises, Sounds and Sweet Airs started out life as a ballet, La Princesse de Milan, for choreographer Karine Saporta in 1991, and Nyman subsequently re-worked it using the original Shakespeare words in 1995. This uses three voices, soprano Catherine Bott, alto Hilary Summers and tenor Ian Bostridge (his first commercial recording! ), but the singers swap roles and portray no particular character. Here the music is much more about the voices, and the fascinating way Nyman uses Bostridge's high tenor compared to Summer's androgynous low alto voice. Both scores are typical Nyman of the period in their uses of high energy rhythmic riffs which owe something to process music, but which Nyman builds into complex and exciting structures. In neither of the scores is the music purely about the voices. Though the singers in Noises, Sounds and Sweet Airs are present for much of the time, the strong accompaniment with its prominent saxophones, has a striking presence also. The drawback in this performance is that the singers words are relatively occluded, this is understandable sometimes, as Catherine Bott's line goes very high, but overall if you want to know what they are singing about you have to follow with the texts in the CD booklet. A similar thing is true for Prospero's Books but here it is very understandable as Sarah Leonard's part as Ariel is spectacularly high, so much so that at times I found the sound a little wearing and was relieved when pure instrumental took over. The final masque (which Nyman confesses to have found textually-awful) uses singers from three contrasting backgrounds, Marie Angel (classically trained), Ute Lemper (actor/cabaret), Deborah Conway (rock) to striking effect. (Though I still prefer Derek Jarman's solution in his film of The Tempest, having Elisabeth Welch singing Stormy Weather). It has to be confessed that the singers on both works sound, at times, stressed by Nyman's rather taxing instrumental-style vocal writing and all the sopranos suffer his fondness for high tessitura. Perhaps it the scores were being recorded today an easier style of delivery might be aimed at, but then again the delivery is part of energetic up-front nature of the music. And we must remember that both scores were written to accompany something, to be part of an overall experience which meant that the music has to evince a strong personality. Nyman's style has changed and developed over the intervening years, his score to The Piano still remains his most notable film score. Yet this is a welcome chance to re-visit music which formed very much the sound-track of our film going and, like much that was influential in the period, bled from popular to classical cultures in an innovative way. Whilst you can detect a debt to American minimalism / process music, Nyman's background in English 17th century baroque music and the fact that he studied with Alan Bush mean that he brings a fascinatingly different voice to bear, and these recordings give us a chance to hear. The Michael Nyman Band is 40 this year, and there will be a big birthday bash at the Barbican.